[SINGAPORE] Singapore's pioneer liquefied natural gas (LNG) aggregator, the BG Group, has moved its global headquarters for LNG and oil marketing from the United Kingdom to here, boosting Singapore's LNG hub ambitions. The move comes a year after Shell set up its global gas headquarters here. Steve Hill, BG's president for global LNG and oil marketing, who has also relocated here, said: "Asia is the world's largest market for LNG and where the BG Group already sends the majority of its cargo. "By moving the centre of our global LNG and oil marketing business to Singapore, the heart of the fastest-growing LNG region, we are closer to many more of our existing customers and are better positioned to develop new and deeper relationships in the region." More than 70 per cent of the British group's LNG shipments today are to Asia, he said; even as BG targets new markets like the Philippines, it has also seen growth opportunities in existing markets such as China, India and South Korea. BG has projected global LNG demand to grow by 5 per cent a year until 2025, or twice as fast as for gas demand overall, driven by Asia and Latin America. The company's LNG supply is also set to spike as new projects start up. One is the Australian Queensland Curtis LNG project, with a capacity of eight million tonnes per annum (mtpa), which is to supply Singapore and other markets in Q4; the other is the 5.5 mtpa US Sabine Pass terminal, which will soon start production. Already, some 25 LNG companies like Gazprom and GDF Suez have set up trading operations here, and super majors like Shell and BP actively book their LNG trades through Singapore. Mr Hill said: "The more people there are here, the better it is for the Singapore market." He added that while the Republic is clearly becoming "a hub for LNG people", it still has to grow, from both a physical trade and financial perspective. The global LNG scene has changed in the last decade, he said; it has gone from having long-term sales deals by national oil companies to becoming a market with more intermediaries. Long-term contracts are essential for gas producers to underpin their costly LNG projects, but short-term LNG supply deals (those of four years or less) are going up in number, Mr Hill noted. About a fifth of BG's deals this year are short-term ones. BG was appointed in 2008 as the initial LNG buyer here with a franchise for three mtpa. 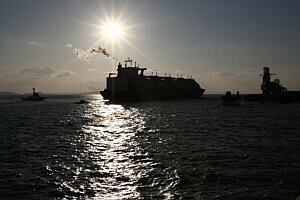 It has, to date, delivered more than a million tonnes of LNG on board 20 vessels. An innovation it introduced was to enable customers such as the gencos to buy spot LNG supplies in volumes that could be as little as a fraction of a cargo-load. Its website says this is a world first. Despite its apparent "disadvantage" in being the first Singapore LNG aggregator, Mr Hill said the group will take part in the coming Energy Market Authority's selection process for up to two LNG buyers for the next tranche of LNG needed here. BG will continue to support Singapore's plan to create a competitive LNG market and regional energy hub, he said. He added that Singapore's status as an established global oil trading hub was another reason BG moved its LNG and oil marketing headquarters here. The group is preparing for a spike in its oil shipments to Asia as production in its Brazil oilfield ramps up. BG expects to market the bulk of this ex-Singapore, which is why the company is building up its oil trading team here. It also hired an Asian oil trading head recently. BG now has more than 70 employees in its Singapore office and will step up this number with hires from universities here, who will be sent for stints in the group's overseas operations.